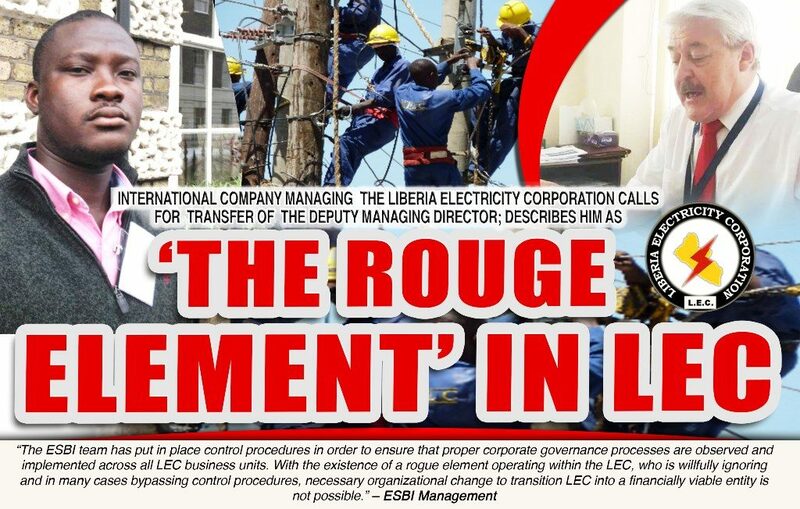 MONROVIA – ESB International, the private firm hired to manage the Liberia Electricity Corporation (LEC), has accused the LEC Deputy Managing Director Joseph Howe, of undermining initiatives aimed at bringing major breakthroughs at the entity. The company therefore laid before the Board of Directors of the Liberia Electricity Corporation (LEC) two hard options for its smooth operation – either it terminates the management service contract or transfer Mr. Howe. When contacted, Mr. Howe told FrontPageAfrica that the letter was addressed to Chairman of the Board of Directors, Mr. Archibald Bernard and he would rather remain silent until it is addressed by Mr. Bernard. ESBI International is a private firm hired by the Government of Liberia under the Millennium Challenge Compact Agreement to manage the LEC. The management service contract was part of the agreement that brought the Mount Coffee Hydro back online. This constitutes the successful conclusion of a two-year process that began in October 2016 with the ratification of the US$257 million grant to the Government of Liberia by the United States Government through the Millennium Challenge Corporation (MCC). Under this contract, ESB International is expected to create an operational efficient and profitable utility that is financially viable; increase capabilities of local staff; improve quality and reliability supply of electricity and customer service and increase the customer base. However, with just nine months into the management of the LEC, ESB says the appointment of Mr. Howe as Deputy Managing Director of the utility is posing some hindrances to the efficient execution of their duties and meeting their objectives. In a communication dated November 12, 2018, addressed to the Mr. Archibald Bernard, Chairman of the LEC Board, the management of EBS said despite having been in charge of the LEC for the last 10 months, they have not been able to achieve their first object which is operating an efficient and profitable utility. “The fundamental reason for the delay in breakthrough is the undermining of those change initiatives that are essential to improve the culture the culture of non-payment for electricity supplied by LEC in Liberia,” the letter noted. ESB Management contended that the LEC granted them full authority to manage, operate and the direct the affairs of the LEC, however, the government appointed Mr. Howe as Deputy Managing Director who has made it clear to them that he is acting on behalf of the government of Liberia. EBSI letter: “Among other things, he has stated to the ESBI team that LEC is being destroyed by ESBI, that he is not answerable to the LEC management and that proposed changes to the organization were simply done to provoke him. Therefore, not only have two parties been given executive authority by GOL, but there is no agreement between these parties on the measures needed to transform LEC. The company noted that the conflict within the management of the LEC is posing reputational risk to the company and its senior managers involved with the LEC by being accountable without having control. ESBI: “Following discussion with our senior management team and out of respect for the authority and office of the President, the ESBI management team cannot deal with this situation as an ordinary LEC employee. This is a political issue and it needs a political solution. We are therefore asking the board – our counterparty to this agreement to resolve this situation. There has been series of protests around the capital over the failure of LEC to repair damaged transformers, thereby, leaving communities in perpetual darkness. During a recent community outreach by the LEC, members of the community complained that management does not respond to their call whenever there is power outage due to damage done to their transformers or meters. They also alleged that some of the LEC workers or those claimed to be employed by LEC – in the entity’s uniform and bearing ID card are constantly in the community and carrying out illegal connections and extorting money from customers; adding that most of these illegal activities can be done at night. They called on the management of LEC to collaborate with the community and set up a monitoring team and provide hotlines that customers will report cases of power theft and other forms of malpractices. “LEC work is technical. It requires people who are well trained. So, those who are responsible for this power theft issue are LEC staff. They are dressed up in uniform with LEC vehicles and are constantly in the community illegally connecting people. I think the LEC should have well paid sizable staff to avoid the problem of power theft,” Richard Kollie, a community member averred. The management of the LEC had gone to seek partnership with the communities to curbing power theft. According to the management, it loses up to 60% of its revenue to power theft and would, therefore, require the collective efforts of the communities to curb theft of power.